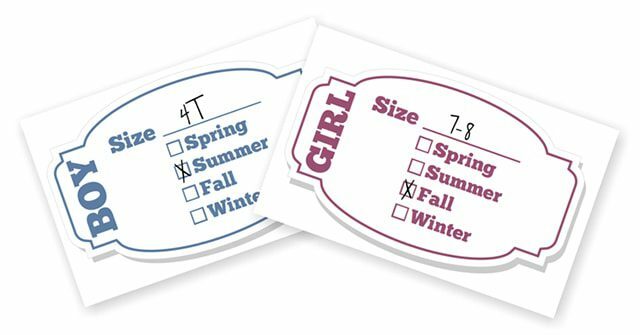 Free Printable Labels for Kids’ Clothing Bins! Our daughter outgrows clothes so quickly. It seems that each season we try on last year’s size only to find that half of them don’t fit any more. While I’m thankful that she’s healthy and growing, I’m ending up with lots of plastic tubs full of her outgrown clothes. We pass them around to several friends and family members before they get donated, so I need a way to keep them organized. We created these printable labels to help with organization. We use several sizes of plastic tubs (depending on what we have on-hand), so there are two different label sizes. Simply print them, trim them to the size you want, and mark the size and season of clothing. Then slip them down into the ends of your clear storage tubs with the size information facing out. You can also tape them to the outside of the tub, covering them with clear plastic packing tape. This will keep them from falling off the tubs and give you a quick visual to help you find the size you’re looking for. Click here to download or print the kids clothing storage labels. P.S. See The Ultimate Guide for Rotating Seasonal Wardrobes for even more tips for this dreaded task! How do you organize off-season and off-size clothing for your kids? Jason & Jennifer Bruce are the husband-and-wife design team behind New Season Design, where they work together to help clients put their best foot forward online. Jason is a pastor-turned-graphic designer, and Jennifer is a teacher-turned-blog designer who also blogs at The Simple Pen about life, learning and the things she loves. Question of the Day: Have You Made Summer Plans?